There are over 1,500 national (fill-in-the-blank) days celebrated in the U.S. every year. Unfortunately, they often come and go without a moment’s notice. Not National Pizza Day!! It’s celebrated by us the same way we celebrate every other day of the year. With great fanfare and unbridled enthusiasm!! *Okay maybe we take it up a notch by throwing in an extra exclamation point. After all, it’s National Pizza Day!! 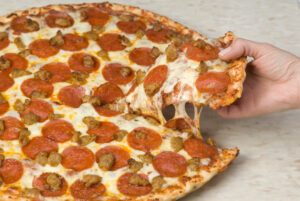 If any day is worthy of an extra exclamation point, it’s National Pizza Day!! On National Pizza Day!! our pizzas pat each other on the back and tell each other to, “Go out there and do your best! !” Come to think of it, they do that every day, they’re just a little more dramatic about it on National Pizza Day!! Before the lunch rush, our cooks and customer service professionals gather around a fresh batch of double-proofed dough for a moment of silence. To honor Naples, Italy — the 18th century inventors of modern pizza. And, of course, our Italian immigrants and returning WWII service men who helped explode the pizza market in the U.S.
Calls get answered, customers get fed and online orders get fulfilled like every other day. But our purpose at work seems a little more exclamation-worthy on National Pizza Day!! We crimp, sauce and top our pizzas with resounding pride!! We’re tickled pink that an entire nation honors something we love making every day!! And our little voices inside our heads say “aww! !” whenever we think about this awesomely amazing product!! From Pepperoni Extreme to The Super Deluxe, we know how to celebrate National Pizza Day!! Even if we have to bend the rules of punctuation a bit. Share your thoughts with us on Twitter or Instagram using #RascalHouse, or post on our Facebook page!